At the exhibition, the audience will see a picture of one of the outstanding masters of Florence of the XV century, who wrote for Cosimo de ' Medici. The first exhibition "Paolo Uccello. 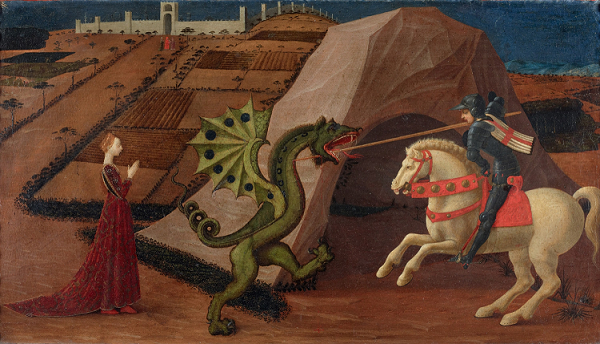 "St. George striking the dragon" took a place in the Apollo hall of the Museum. It should be noted that in the collection of the State Hermitage there is not a single work of this artist, as well as works by Paolo Uccello (1397-1475) in Russian museums are not represented at all. To show the work of the great artist of the Renaissance became possible thanks to the Museum of Jacquemart-Andre in Paris, which willingly gave this opportunity to the Hermitage in St. Petersburg. The main hobby of the master — the laws of linear perspective, the problem is extremely relevant for the Renaissance. Perspective searches are combined in this artist with a decorative solution to many subjects, an example of this is the work of the Paris Museum. The works of this master of the XV century are rich in imagination and are known for their exquisite decorative and colorful. In an amazing way, Uccello weaves artistic techniques that meet the realistic needs of the new time, and nostalgia for the departed chivalry. The world of the past finds a new life in the works of the Italian master. The canvas "St. George striking the dragon" tells the audience one of the classic fairy legends. Fearless knight in the picture Uccello again crushes the terrible dragon with one blow and saves the beautiful Princess, who all this time watching the battle. The plot came to the European world from the East and received a new interpretation: the girl symbolizes the Christian church, the dragon - paganism. The peculiarity of the composition is that there is a perspective in it, which was new for the epoch. This painting by Paolo Uccello depicts Saint George piercing a dragon with a spear, who was going to attack the king's daughter. This theme of Eastern origin was raised by Christians to symbolize the liberation of the Church, oppressed by paganism. The battle is an important moment in the history of St. George. There are many examples in both painting and sculpture. The profile with the Princess medal, the Arabesque dragon, which seems to have come out of the Gothic lining, and the image of the Saint are traditional. While landscape is perceived as a modern way of introducing perspective. This duality is very characteristic of the art of Paolo Uccello. The classic story, captured by the hand of the master, guests and residents of St. Petersburg will be able to see firsthand in the Hermitage.